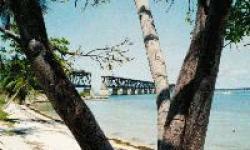 Bahia Honda State Park and Beach on the tropical island of Big Pine Key, Florida, USA covers over 500 acres complete with offshore island offering some of the best snorkeling and beachcombing in Florida, and an award winning beach and historic bridge. There's a concession service and gift shop a snack bar and boat slip rentals, you can also hire kayaks and enjoy daily snorkeling tours to the stunning Looe Key National Marine Sanctuary. Bahia Honda State Park and Beach also offer boat trips to the reef, or you can bring your own boat for launch, there are sea wading birds and shore birds, as well as the Sea and Sand Nature Center introducing nature loves to the island's plants and animals, plus if you want to stay over they have campsites and vacation cabins, and accessible amenities, come for a memorable visit to these beautiful surrounds.